A Little Lyrical - Page 2 of 30 - Mum & Wife musing about life! Still looking for Christmas gifts? Check out the choices I made for some of my friends and family! This week I was gifted a few items by Paladone when they kindly asked if I wanted to receive something as a present for Christmas. They sell so many wonderful items and there’s always something for everyone. I picked out three things with certain people in mind which I will wrap and gift them this Christmas. The first item is for a star wars lover! This Tie Fighter desk lamp is perfect for my Star Wars obsessed hubby! I hope he doesn’t read this…..I don’t think he will! It’s USB powered so when sitting on a desk work area won’t take another plug, just plug it in to a USB outlet. Why am I always running short of plugs? If you are not then you could always use a USB plug adaptor instead if you’re putting it in an area with no computer. The Smartphone Light Graffiti can is going to be given to my 7 year old. He had an iPad for his birthday this year so this is something he would love to play with. For this gift you use a long exposure app to write words or draw pictures with the tiny can. The app captures what you are drawing and makes it look like a graffiti art without actually making any mess! The fabulous Disney Enchanted Rose Light from Beauty and the Beast by Paladone is a very special choice for a friend of mine. She adores the film and this is going to be perfect for her. It’s USB powered meaning it’ll look amazing on her desk while she’s working away at the computer. I know she’s going to love it. Some of my other favourite items by Paladone are in the Harry Potter section. There are some beautiful gifts for fans of the books and films. Unfortunately in this house my boys haven’t caught on to Harry Potter yet despite my best efforts so those gifts would be a waste for now. I’ll save buying Harry Potter items for another year. Or maybe I should buy them for myself! With grateful thanks to Paladone foe helping me to tick some people off my list! Well little guy, now you are one. I’m not sure where the year has gone? It seems like only last week you were born. I love watching your birth back. It was so special. I’m sad I’ll never do it again. As you grow though and we say goodbye to the baby stages my love for you grows and grows. You made us complete, you made us a five. I made you a birthday video. It’s so you can see how you’ve grown. I loved looking back at the last year and all the fun we’ve had. I had so much to include but had to edit lots out. I hope that when you are older and watch it back you will see how much you are loved by everyone. I can’t believe it’s a month since my last post. There was good reason for the gap and that’s because we’ve been away. We’ve just got back from our favourite place in the world…Walt Disney World! My love of Walt Disney World started in 2004 on my first trip. Since then I’ve been lucky enough to go back 10 times, including our honeymoon. We first started taking the boys when Thomas was just 16 months old (obviously he was our only boy back then as he’s the oldest). This was Thomas’ 4th trip to Walt Disney World. I try to make sure he realises how lucky he is to be able to visit such an amazing place. If you haven’t been to WDW it’s hard to explain the hold it has on you once you’ve been to experience the magic. We are absolutely addicted. This year we had booked two weeks at the Beach Club resort staying club level. We had never stayed at the Beach club before but knew we were in for a treat with the resort facilities. The Beach club has the best pool on Disney property (if you don’t count the water parks). Staying club level meant we had access to the club level lounge at certain time for snacks and drinks. This is something I will cover in a later vlog. For now I have managed to edit and go live with our travel day vlog. I’m already onto editing all the other days. I took a lot of footage so it’s taking a while to go through it all! However I am loving the memories I’ve captured. We travelled from Manchester Airport to Orlando International airport on a Thomas Cook flight in the Premium Cabin. Roo is too young for a seat so he travelled on my knee for the flight. The flight was roughly 9 hours in duration and we arrived in Orlando late afternoon. We are already missing the place like crazy! Roll on the next trip! Having three children keeping on top of skin care needs to be quick and easy. Nobody in our house wants to be spending ages with creams and rubbing, they want to be off to the next toy or game. So with that in mind I’ve written a list of the top tips around skin care I’ve learnt over my years of being a parent. Baths – Unless your child is covered in something sticky or icky then don’t bath them everyday. From the moment they are born the skin produces amazing natural oils to protect itself. Bathing excessively washes these off, leaving the skin prone to drying out. We usually bath the boys once every other day. Unless of course they look like they’ve been in a pile of mud! Soaps – Be aware of what you are using in the bath, most soaps are harsh on little ones skin and again cause the natural oils to wash away. Did you know that Epaderm junior can be used as a soap substitute? It’ll get little ones clean whilst keeping them moisturised. Cloth nappies – Now I know not everyone likes the idea of them. With my eldest I used cloth nappies full time and I never ever had a problem with nappy rash. With the other two I’ve used cloth part time. I notice a massive difference in their nappy area skin when we are using cloth. It much less prone to rash or any redness. So if you do struggle with this then it’s worth considering the use of cloth nappies. Even if it’s just part time. Just one nappy a day would make a difference not only to their skin but to the environment too. Moisturise after bathing them – Just as we do it’s nice to have soft skin after washing so little ones are no different. Be aware what you are using though as some creams can be full of extra unwanted chemicals and highly perfumed. Epaderm is fragrance, colour and SLS free. 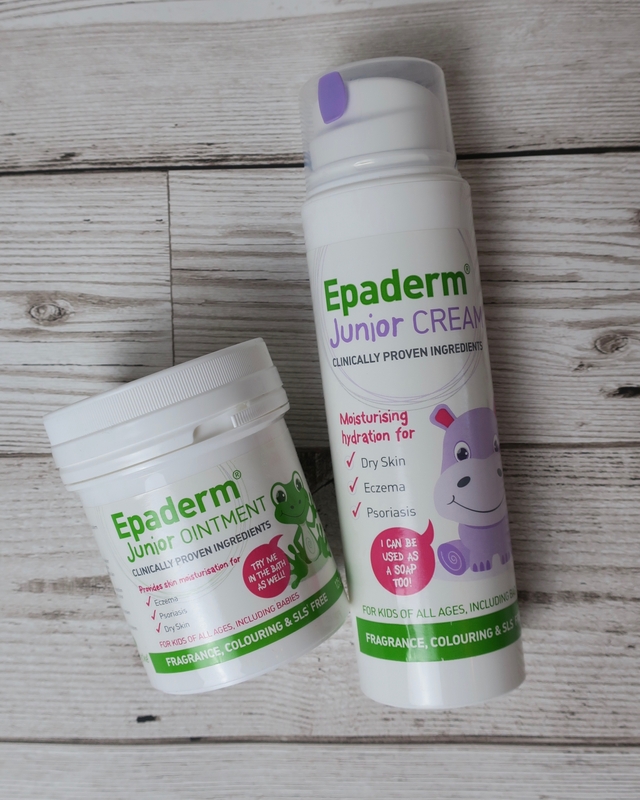 The cream which comes in a pump top bottle is super easily absorbed into little ones skin so you won’t be spending ages rubbing it in. It’s also suitable of eczema, psoriasis and dry skin. Stay Hydrated – This is especially important during the summer months. We’ve been lucky to have had an awesome summer in the UK this year. If there’s one thing though that’s going to give you glowing healthy skin from the inside out its water. I like to have reusable bottles all over the house and garden so that it’s easily available for the boys to drink. If your children don’t like plain water, try adding a small amount of sugar-free squash or make some fruit tea and let it cool. Studies have shown that water helps them learn better too, so make sure they take a bottle to school. This week I started a brand new job! Not only was it my first day back after maternity leave had ended but everything was new. New job, new workplace, new colleagues….. When I got home after my first day these were waiting form me from a friend. They are called candy floss and they are stunning! Oh dear, we’ve come to the end of day 2 with the childminder and again you’ve been upset. I so desperately don’t want her to hate you. I don’t want her to think you’re the difficult baby. I love you so very much and know she never will but I want her to like you. To see your adorable smile. I want her to like playing with you and to help you to develop. I just want you to be safe and happy in her care. I know it’s not her. I see her all the time at school and all the other children are happy. It’s such early days and I know you need time to adjust but it breaks my heart that you are so sad in the day. She’s told me that today whilst you were out and about you were better but from 3pm you cried. She reassures me theres no tears but still you are obviously distressed. You’ve barely drunk the breastmilk that I have left for you but she said you’ve eaten so that’s good I suppose. I wish you could understand why I have to leave you there. I leave you there because I love you and want to be the best person I can be by going to work. Please don’t change little guy, it’ll be ok. We can work through this.